Well I made it back from my eye test (still short sighted but no worse than before, and under instruction to blink more) and am happy that I was able to write that short story. 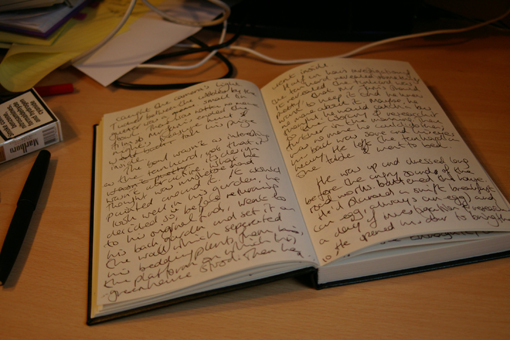 I wrote it in a notebook with a fountain pen, which was a very nice experience indeed. I’ll type up and edit it next week, I hope. Dead pleased to be able to tell you that you can now pre-order Ways to Live Forever by the very talented and very lovely Sally Nicholls. I’ve a feeling it will be very good. Bangledeshi food for me tonight. I suppose I’d really best tidy myself up before going out (see photo below for reasons). Have a marvellous weekend, one and all. The blinkin’s going well, thanks!It’s an interesting process, writing something in longhand, I think, because when you type it up it’s going through an almost-semi redraft. And it’s a nice feeling. And it looks pretty.Im not convinced I could do it for a whole first draft of a novel though. We’ll see.Nik.Nik.